My favorite of the bunch was the Tamanohikari, smooth with a slight hint of tropical fruit, and the Dassai 50 was particularly notable because of its cloudy appearance and strong anise flavor. This is created by adding back some of the usually-filtered rice solids. All sakes were served chilled, which according to Simkin is the proper way to drink premium sakes. Because they are rich in aromatics, heating them up usually blows off those wonderful flavors and smells. It isn't wrong to serve sake warm, but it's not worth doing with one you've paid a lot of money for. And of course when you order sake at a Japanese restaurant in the states, they usually heat it up way too much killing all the flavor in the beverage. 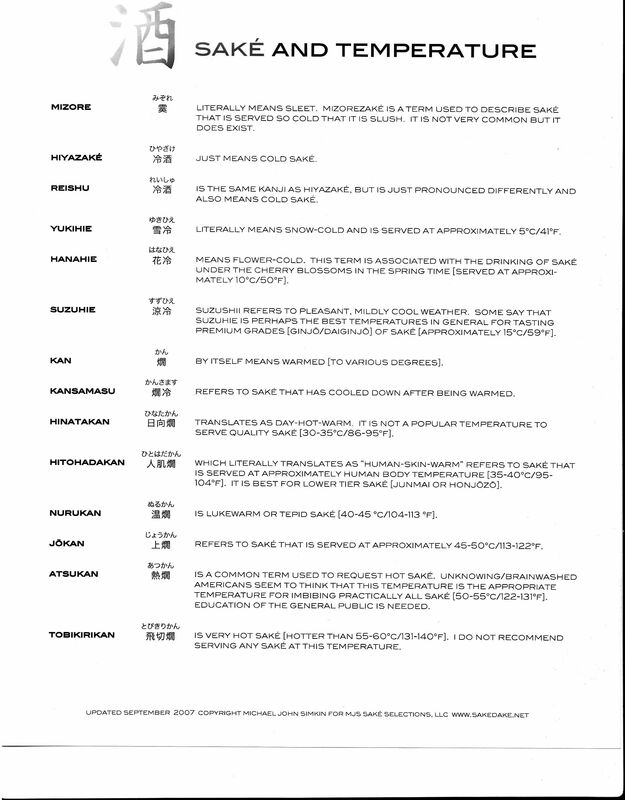 (Interestingly there are 14 different proper temperature points at which to serve sake.) 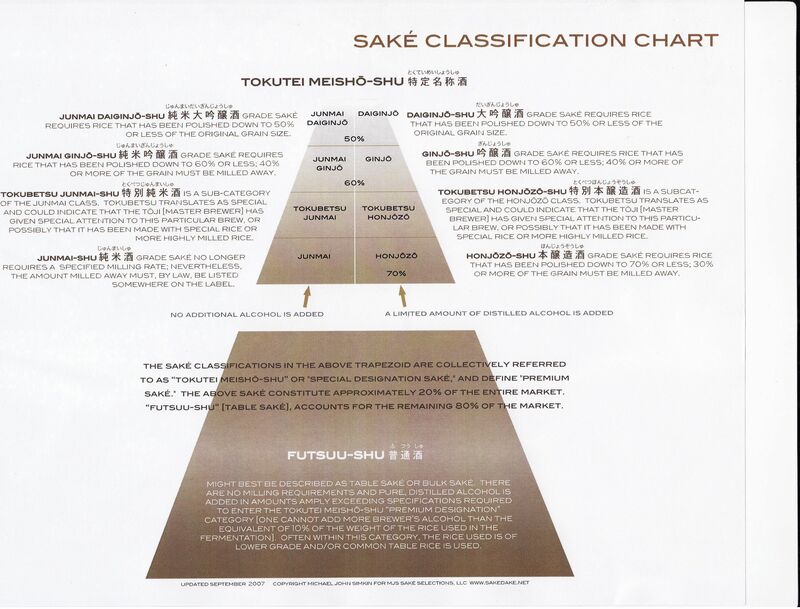 I could spend a great deal of space here talking about sake itself, but there are websites out there that can give you this info. Of all the cheeses, the Ibores, the Montgomery's Cheddar and the Stichelton were the most versatile (i.e. worked well with the greatest number of sakes). 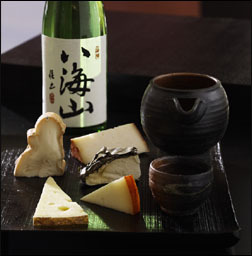 Constant Bliss fared the poorest, not because the cheese is bad (it's in fact quite good), but because its very strong aromatics from the raw cow's milk and the bloomy rind tend to compete with the strong aromatics of the sake. 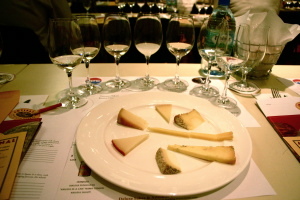 In general, though, I was quite pleasantly surprised by how well all of the cheeses paired with all of the sakes. It's right up there with white wine for me now, in terms of how well it can pair with cheese. The shochus, however, did not fare nearly as well. I think the much higher alcohol content of these drinks really got in the way and masked any nuances of flavor that were there. Shochu is a distilled liquor while Sake is a brewed beverage (like beer or wine), and I think the more subtle flavor of those latter beverages tend to work better in such pairings. Artisanal is offering this class again this Thursday, 12/13, and if you're in the New York area I would highly recommend taking it. I should also say something about Artisanal's revamped class format. Not long after the company was purchased by American Home Food Products, they changed the class format to start with about 10-15 minutes of mingling time. During this time they serve champagne and sparkling water, a great cheese plate from their Celebration Box, a fondue made with their quick fondue blend, as well as warmed gougères (cheese puffs) which are just heavenly. After the class they served cheesecake, which, by that time, was a bit much considering how much food I'd already taken in, but it was still some VERY good cheesecake. All these products are available for purchase on the website, and I imagine that the purpose of the new class format is to showcase these products to an interested audience. Very smart marketing.